Archangel Michael feast day is commemorated on Sep 6/19; Nov 8/21. This icon was mounted with a capsule of oil. 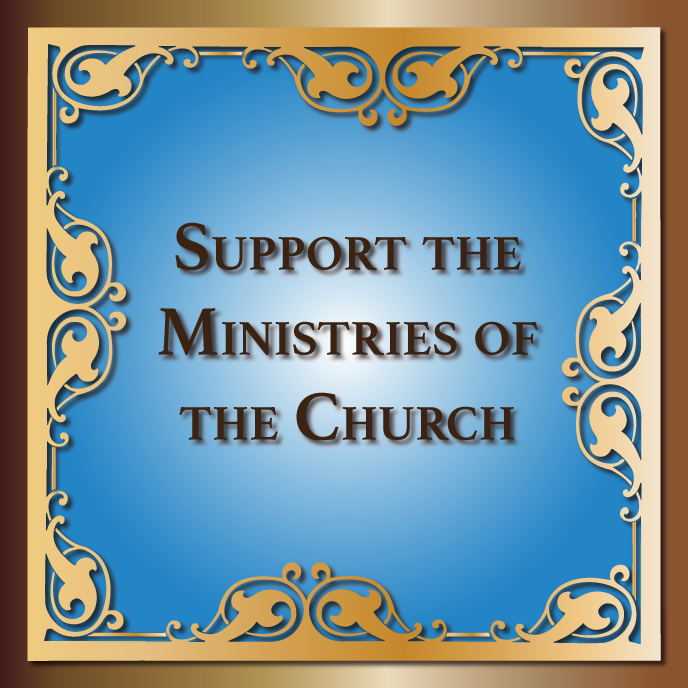 Plastic frame Size: 9.5" x 8"
Velvet frame Size: 5.5" x 6.5"
Smooth print mounted to a wooden icon panel. Blessed Equal-to-the-Apostles Olha feast day is commemorated on Jul 11/24. This icon was mounted with a capsule of oil, blessed on the relics of the Holy Venerable Agapitus of the Kyiv Caves. Size: 3 3/4" x 4 3/4". On a blue velvet case or on a red velvet. Foldable Icon with Left - Mother of God of Kazan and Right - Our Savior Jesus Christ. On a red velvet case. Foldable Icon with Left - Mother of God of Kazan and Right - Our Savior Jesus Christ. On a blue velvet case or on a red velvet case. Foldable Icon with Left - Mother of God of Kazan and Right - Our Savior Jesus Christ. On a blue velvet case. 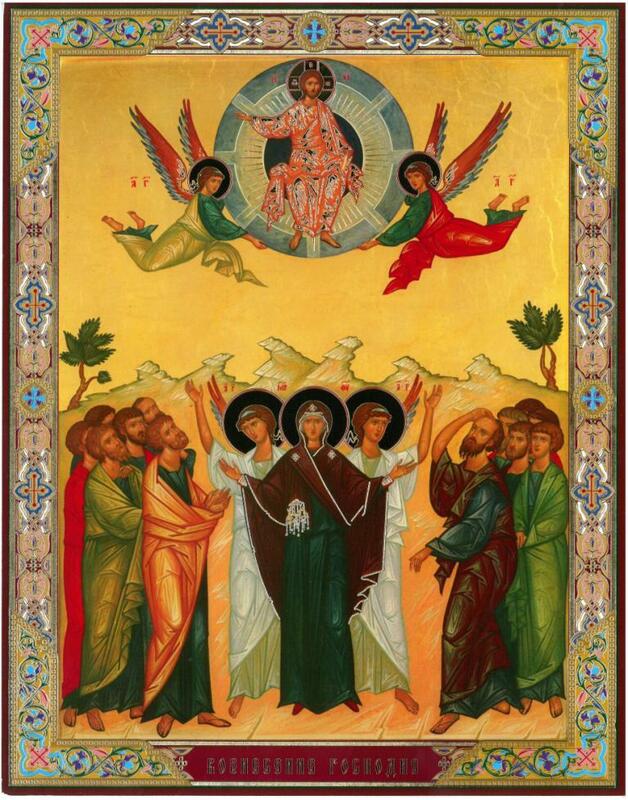 Foldable Icon with Left - Mother of God and Right - Our Savior. On a blue case, ideal for traveling. 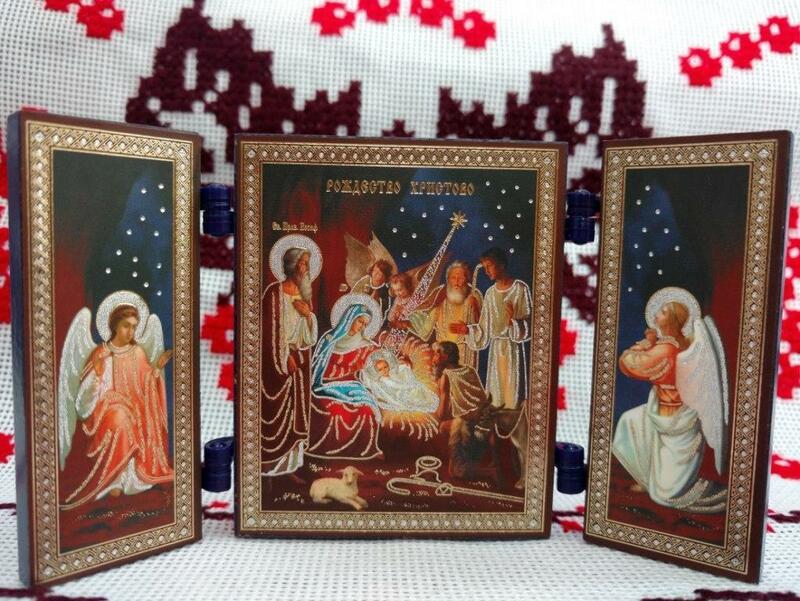 Foldable Icon with on the Left side - Mother of God of Kazan with Our Savior and on the Right side - Our Savior. On a blue velvet case. Great Martyr John the New of Suceava feast day is commemorated on Jun 2/15. Holy and Great-martyr Demetrius the Myrrhgusher of Thessalonica feast day is commemorated on Oct 26/ Nov 8. Holy Apostle Paul feast day is commemorated on June 29/ July 12. Size: 3 3/4" x 4 3/4"
Icon of Holy Apostle Peter feast day is commemorated on June 19/ July 12. Holy Apostle Timothy feast day is commemorated on January 22 / February 4. Holy Blessed Wenceslaus, Prince of the Czechs, feast day is commemorated on Mar 4/17; Sep 28/ Oct 14. Holy Equal-to-the-Apostles Great Prince Volodymyr, enlightener of Kyiv Rus, feast day is commemorated on Jul 15/28. Icon of Holy Great Martyr George feast day is commemorated on Apr 23/ May 6; Nov 3/16; Nov 10/23 and Nov 26/ Dec 9. Holy Great Martyr Marina (Margaret) of Antioch in Pisidia feast day is commemorated on July 17/30. Holy Great Martyr Marina (Margaret) of Antioch in Pisidia feast day is commemorated on Jul 17/30. Holy Great-martyr and healer Panteleimon feast day is on Jul 27/ Aug 9. Holy Great-marty Barbara feast day is commemorated on Dec 4/17. Holy Martyr Anatolius of Nicaea feast day is commemorated on Nov 20/ Dec 3. Holy Marty Rhais (Raisa) of Alexandria feast day is commemorated on September 5/18. Holy Marty Tatiana of Rome feast day is commemorated on Jan 12/25. Holy Martyr Alia feast day is commemorated on March 26/April 8. Holy Martyr Caleria (Valeria) feast day is commemorated on Jun 7/20. Holy Martyr Christina feast day is commemorated on Feb 6/19; Mar 13/26; May 18/31. Holy Martyr Galina feast day is commemorated on Mar 10/23; Apr 16/29. Holy Martyr Hope (Nadia) feast day is commemorated on September 17/30. Holy Martyr Irene of Thessalonica feast day is commemorated on May 5/ 18. Holy Martyr Julia feast day is commemorated on May 18/31 and July 16/29. Holy Martyr Love (Lyubov) feast day is commemorated on September 17/30. Martyr Ludmilla, Princess of Czechia feast day is commemorated on Sep 16/29. Holy Martyr Matrona feast day is commemorated on April 19th /May 2nd. Holy Martyr Natalia feast day is commemorated on August 26/September 8. Holy Martyr Nazarius feast day is commemorated on Oct 14/27. Holy Martyr Nice (Victoria) feast day is commemorated on April 16/29. Holy Martyr Theodot (Bohdan) feast day is commemorated on Nov 7/20. Holy Martyr Valentina of Caesarea feast day is commemorated on Fev 10/23. Holy Martyr Valerius, of the 33 Martyrs of Melitene, feast day is commemorated on Nov 7/20. Holy Martyrs and Confessors Samonas, Gurias and Abibus feast day is commemorated on Nov 15/28. 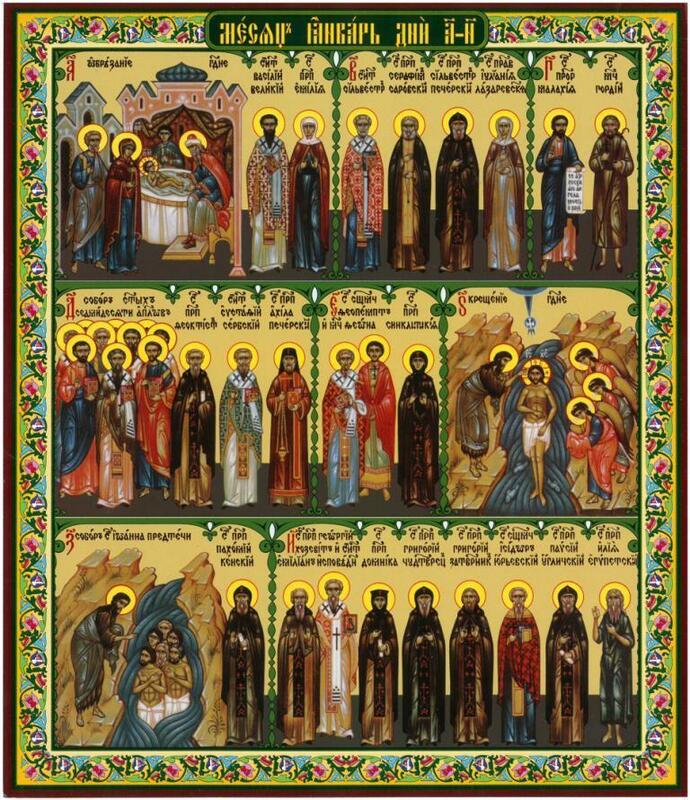 Icon of Martyrs Sophia, Faith, Hope & Love feast day is commemorated on September 17/30. 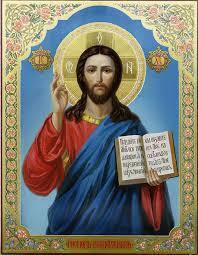 Holy Prophet and King David feast day is commemorated on the fisrt Sunday after Nativity of Our Lord. Holy Prophet Daniel feast day is commemorated on Dec 17/30. Holy Venerable Queen Tamara feast day is commemorated on May 1/14. Size: 11" by 8 1/2"
Icon of Our Savior Jesus Christ praying at the mountain. size: 9 1/2" by 7 1/2"
Martyr Eugene feast day is commemorated on Dec 13/26. Priest Martyr Rustic feast day is commemorated on Oct 3/16. Martyr Veronica (Virineya) feast day is commemorated on Oct 4/17. Mother of God "Helper in Childbirth"
Mother of God "Helper in Childbirth" is commemorated on Dec 26/ Jan 8. Ікони Божої Матері "Спорительница хлібів"
Icon of the Mother of God Multiplier of Bread is commemorated on Oct 15/28. Icon of the Mother of God the Life-Giving Fountain commemorated on May 5/18. Framed pair of icons with glass of Our Savior and Mother of God. Size: 10.25" x 9.25" each icon. Size: 10" x 8.5" each icon. Framed pair of icons with glass of Our Savior and Mother of God of Kazan. Pair Icon of Our Savior and Mother of God who gives "Support to the Humble"
Framed pair of icons with glass of Our Savior and Mother of God who gives "Support to the Humble". Saint Angelina, despotina of Serbia feast day is commemorated on July1/14; Dec 10/23. Saint Basyl the Great, archbishop of Ceasarea in Cappadocia, feast day is commemorated on Jan 1/14; Jan 30/Fev 12. Saint Cyanna (Kyra) of Syria feast day is commemorated on February 28 / March 13. Saint Luke of Crimea feast day is commemorated on May 29 / June 11. Size: 7 1/2" by 5"
Saint Nicholas the Wonderworker, archbishop of Myra in Lycia, feast day is commemorated on May 9/22; Dec 6/19. Saint Seraphim of Sarov feast day is commemorated on Jan 2/15; Jul 19/ Aug 1. Set of Icons of Twelve Great Feasts. The Icons are not Laminated and doesn't come with a frame. Set of Icons of Twelve Great Feasts, Icons of Archangel Michael, St. Demetrius, St. Volodymyr the Great, St. Mary Protectress, Sts. Peter and Paul, Sts. Sophia, Faith, Love and Hope, St. Nicholas, Christ the BrideGroom, St. Panteleimon, St. George, St. Andrew, The Prophet Elijah, St. Basyl the Great, St. John the Baptist, Holy Trinity and St. Seraphim of Sarov. 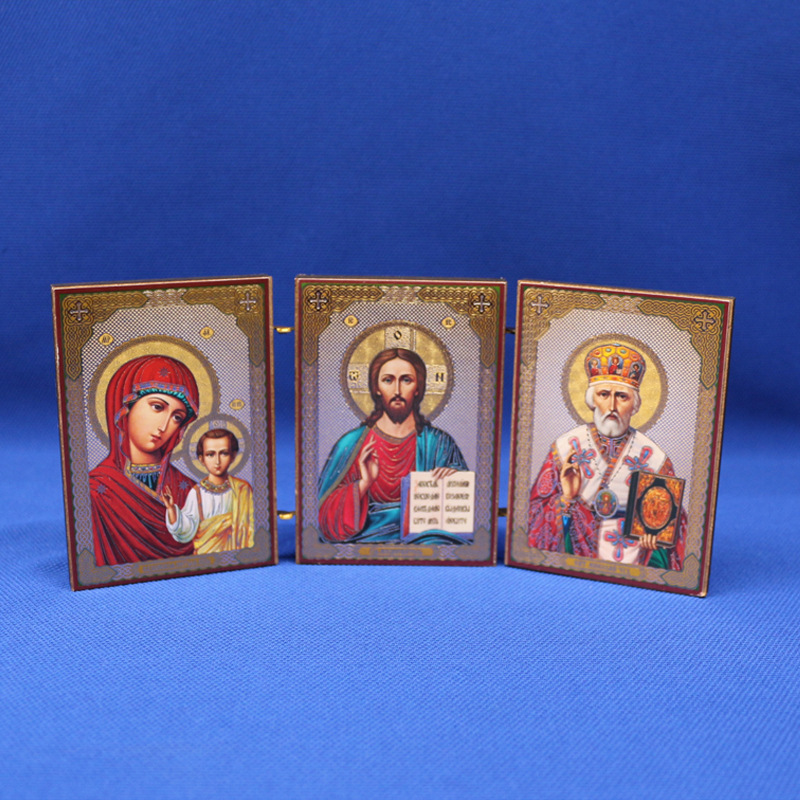 Set of 48 Veneration Icons of the Twelve Great Feasts, and Daily Saints of the Orthodox Church. Icon of St. Anthony the Great, with wooden frame with glass. Size: 8" x 7.5" 2"
Holy Glorious Prophet, Forerunner and Baptist, John, feast day is commemorated on Jan 7/20; Fev 24 / Mar 9; May 25/ Jun 7; Jun 24/ Jul 7; Aug 29 / Sep 11; Sep 23/ Oct 6 and Oct 12/25. St. Leo the Great, pope of Rome, feast day is commemorated on Feb18 / Mar 3.
size: 6 1/2" by 4"
Size: 3 1/2" by 4 1/2"
Triple Car Icon - Center: Christ Pantokrator, Left: Mother of God and Right: St. Nicholas the Wonderworker. Center: Christ Pantokrator, Left: Mother of God and Right: St. Nicholas the Wonderworker. It has a sticker on the back to fix in your car. 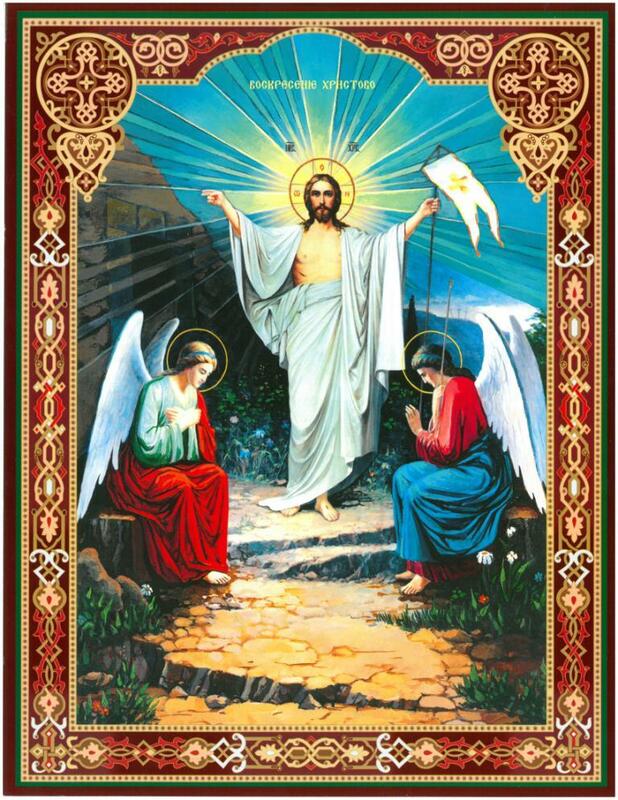 Sizes - Large: 4" by 2"
Small: 3 1/2" by 1 1/2"
Size open: 10" x 6.25"
Size closed: 4.75" x 6.25"
Foldable Icon with Center- Our Savior Jesus Christ, Left - Mother of God With Jesus Christ and Right - St. Nicholas. On the back of the Icon - "Save and protect." On the back of the Icon - Save and protect. Triple Icon with Mother of God "Inexhaustible Cup"
Size: 7 1/2" by 4 1/2"
Triple Icon with Protection of the Mother of God "Pokrova"
On Back – cross and written in Church-slavonic "Christ is Risen from the dead..."
Venerable Agapitus of the Kyiv Caves feast day is commemorated on Jun 1/14. Venerable Mary the Egyptian feast day is commemorated on the 5th Sunday of Great Lent and on Apr 1/14. Venerable Melania the Younger, nun, of Rome feast day is commemorated on Dec 31/Jan 13. Venerable Zoe of Bethlehem feast day is commemorated on Mar 13/26. Venn. Spyridon Prosphorabaker of Kyiv Caves feast day is commemorated on Oct 31/ Nov 13.